On Thursday, February 11, 2016, Temple University Health System officials hosted a ribbon cutting for a brand new Fox Chase Cancer Center-Temple University Hospital Bone Marrow Transplant (BMT) Outpatient Clinic. Fox Chase President and CEO, Richard I. Fisher, MD, welcomed distinguished guests in the new facility housed at adjacent Jeanes Hospital, part of Temple Health. 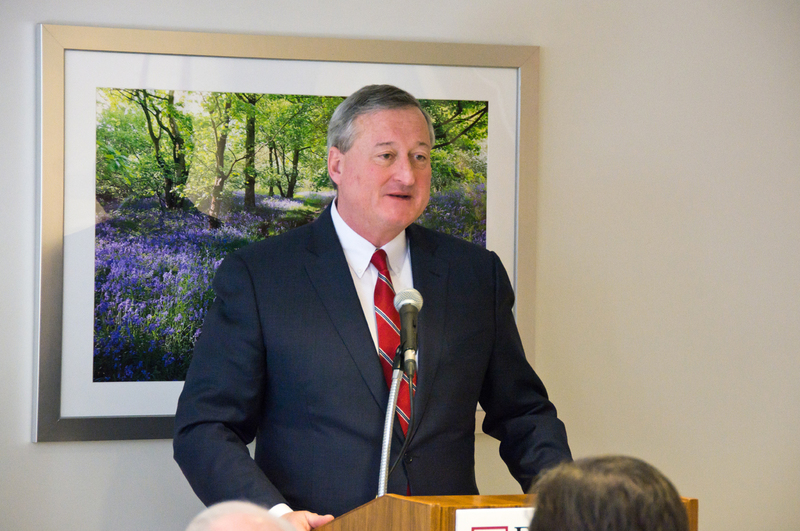 Fisher was joined at the podium by the Honorable Jim Kenney, Mayor of Philadelphia, Larry Kaiser, MD, President and CEO, Temple Health, Henry Chi Fung, MD, FRCPE, Director of the Fox Chase -Temple BMT Program and Heather Walters, a former patient. The speakers described the advanced BMT facility and highlighted the sophisticated level of clinical care offered to both inpatients and outpatients. Dr. Kaiser credited Dr. Fisher, whose leadership in reinvigorating the BMT Program and in recruiting world-class physicians has propelled Fox Chase forward. This leadership together with the invaluable insights and guidance of director Dr. Fung has created promising new research and treatment offerings to patients with blood cancers. The program boasts prestigious distinctions and accreditations for exceptional patient care and research – most recently by Independence Blue Cross, which named Temple University Hospital as a “Blue Distinction Center for Transplants” in recognition of the Fox Chase-Temple BMT Program’s expertise in performing adult bone marrow transplants. Since 1990, the Fox Chase-Temple BMT Program has performed more than 1,500 adult bone marrow transplants to treat patients with leukemia, lymphoma, multiple myeloma, aplastic anemia and other blood disorders. The Fox Chase-Temple BMT Program is located on the campus of Jeanes Hospital, which is part of the Temple University Health System. All hospital services are provided by Temple University Hospital. The ribbon cutting ceremony was covered by WPVI 6ABC Action News, FOX 29 News, The Philadelphia Inquirer, and The Northeast Times.